If you have plans to remodel or add a bathroom, you may already be in love with the room design, including the comfy new garden tub or whirlpool. It’s gorgeous. You can imagine soaking away the stress of everyday life while looking out the window. The window! The window above the tub will fill the room with light, but what about enjoying some privacy in your bathroom sanctuary? Most homeowners are especially interested in maintaining privacy while allowing in as much fresh air and sunlight as possible. While a carefully planted row of evergreens affords plenty of privacy, you may have a zero lot line or a popular walking path situated in close proximity to the new bathroom you plan to add or remodel. This privacy predicament requires a special solution! When adding a room, or replacing an entire bathroom wall, you have the opportunity to make a bold statement with a new construction window designed just for your space. If your window is featured above a garden tub or whirlpool, privacy and aesthetics are important. While a frosted glass window services the privacy issue, it lacks the dramatic decorative appeal of a Hy-Lite® decorative glass window or Hy-Lite® acrylic block window. If you’re on a budget and your dream bathroom includes a garden tub and picture window, check out the 48-inch square Bath-Lite® Series, an elegant line of decorative glass windows. The three designs of the Bath-Lite Series – the Aurora, Olympia and Texas Star – are specially designed to be both attractive and affordable. Other Hy-Lite decorative glass windows come in a variety of sizes and styles, such as the elegant Craftsman, Victorian or Renaissance designs. If your room needs a boost in energy efficiency, you may want to look at a Hy-Lite acrylic block window with the SunBlock Plus option which includes UV inhibitors and infrared absorbers to reduce solar heat gain coefficients (SHGCs) to as low as .19. If it’s a replacement style window you need, Hy-Lite offers fixed and custom-sized operable acrylic windows in a selection of styles and colors. Custom-sized Hy-Lite replacement windows include casement, awning, single hung, slider and picture windows. The operable Hy-Lite acrylic block window is 70% lighter and 33% more energy-efficient than traditional glass block windows. 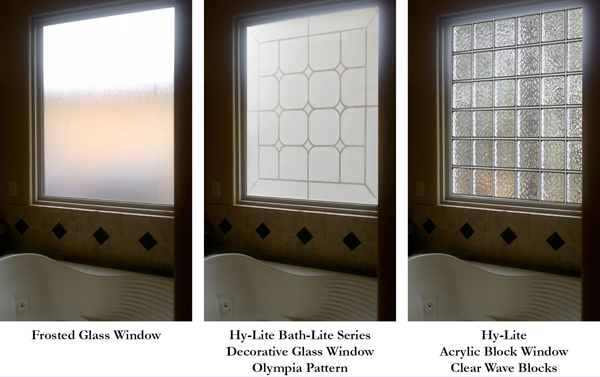 Hy-Lite acrylic block and decorative glass windows offer homeowners the opportunity to design with style yet have the fresh air, sun light, and privacy they so deeply value in a bathroom sanctuary. For more information about Hy-Lite windows, please explore the Hy-Lite website.